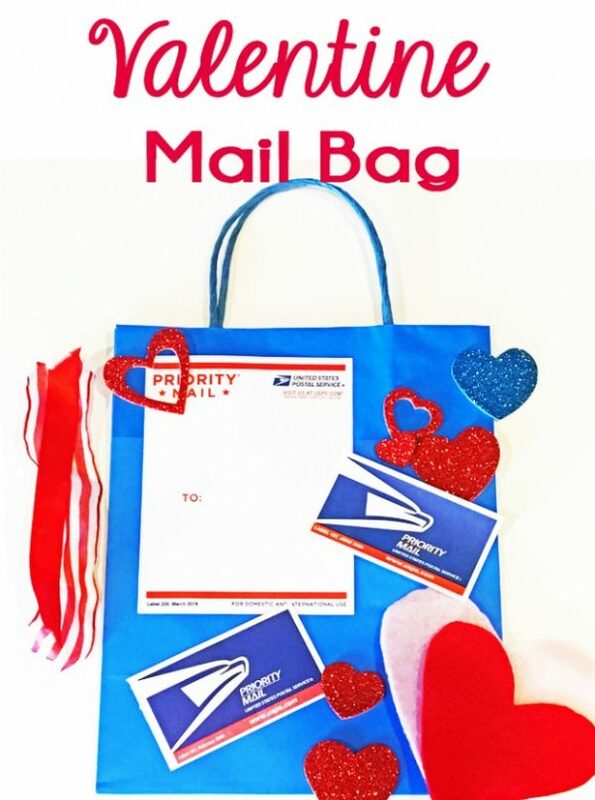 If you’ve ever been told by your child, frantically, at 8pm on February 13th that she needs to make a mailbox for her valentines for the class party the next day, and it has to be homemade and it has to have a theme, then this Valentine Mail Bag craft is for you. A hack. A DIY. A time saver and a valentine rescue all in one. 2 years ago we went all out and made a super cute yeti mailbox for my little boy’s class valentines, which he loved and of which he was super proud. It was labor intensive. It was time consuming. It required three trips to the craft store. The adorable, elaborate, wow-factor Valentine mailbox examples available you-know-where are awesome, it’s true. I admire them. I applaud them. I wish I could be them. But last year I scaled it waaaaay back and I’m so happy I did. A bag instead of a box, and decorations using only materials we had on hand instead of trips to the craft store. A perfect awesome last minute solution. 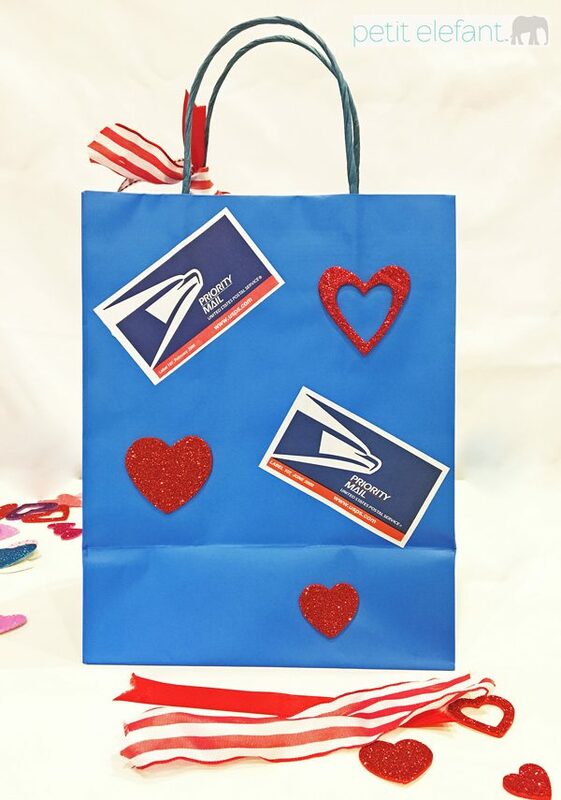 A paper gift bag makes a perfect Valentine mailbag. It’s lightweight and easy to carry, easy enough to decorate and won’t get smashed on the way to school! It’s easy to get valentines in and out! We surely have enough crafty odds and ends in the art bin to pull this off, we even have googly eyes! And there’s always the internet. At first my kids were dubious--no box? But it has to be a box! But once he got to school and his classmates showered him with compliments for his Boston Red Sox themed bag, he was perfectly happy. Photos of that bag do not exist, but it was simply a red gift bag with baseball stickers and team logos we printed. Grand total of 10 minutes and zero dollars. 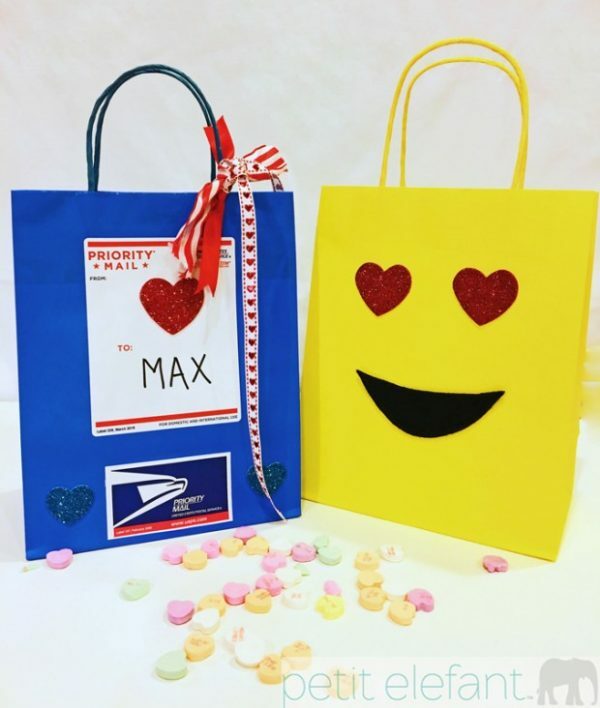 Today we are sharing my kids’ Valentine mail bag designs with hope they’ll inspire you, or relieve you of some stress, or maybe you’ll take it up a few notches and turn this idea into a 4 tier cupcake-wars style mailbox. Go for it. I’ll be envious, but well rested. Since these bags were made for boys, we kept things understated and not too frilly. But embellish with all the the ribbons, lace and sparkles you like. This is winning, for everyone. To be quite honest, these were put together with just scraps and odds and ends in our craft bin. 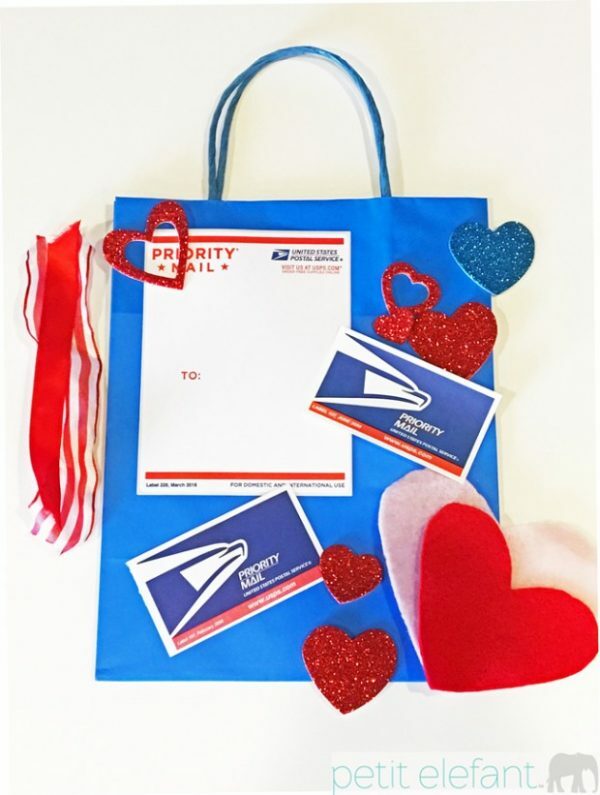 For the blue bag we printed off postal service images and labels and affixed them to the bag, along with a bit of Valentine pizazz in the form of glittery heart stickers. We added some ribbon just for fun, but I suspect my boy will remove it later. 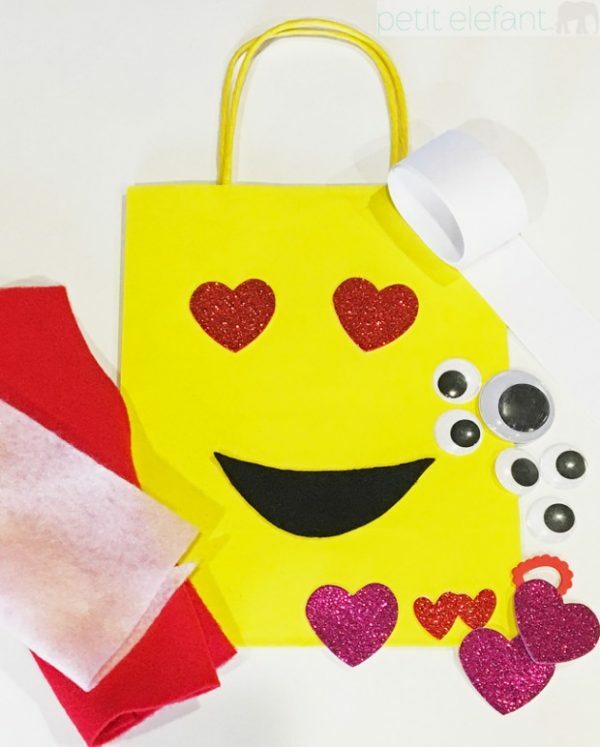 For the yellow bag–2 glittery heart stickers and a smile cut from black felt or paper add up to an on-trend emoji bag, with just enough Valentine-y style. 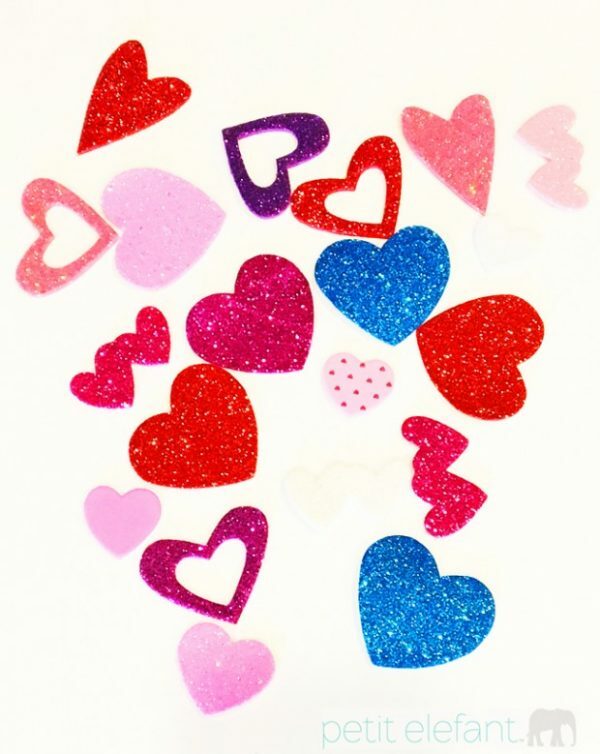 For more easy and cute valentine ideas,we love this and this.